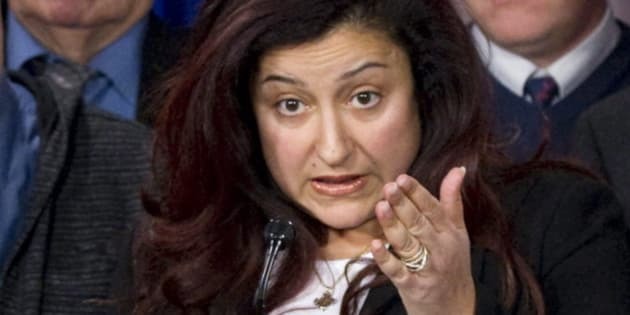 OTTAWA - A former Bloc Quebecois MP who quit the party after a disagreement over Quebec's proposed secularism charter says she's no longer a sovereigntist. Maria Mourani made the announcement in an open letter, where she writes that she's leaving the "independentist" movement because it has changed for the worse. She writes that she now believes federalism is the best way to defend minority rights. Mourani says she's remaining as an independent MP and won't join a new political party for now. The independent Montreal MP says she's been reflecting on her political beliefs since her expulsion from the Bloc Quebecois caucus in September over her public criticism of the Parti Quebecois government's proposed values' charter. She said she decided the Bloc was not for her — "I had no place there" — but also had harsh words for the PQ. "The Parti Quebecois of Pauline Marois has created a new political culture . . . .where you're ready to fight an election on the backs of part of the population, elections based on fear, division." The proposed charter would prohibit public sector employees from displaying or wearing any overt religious symbols such as the kippa or the hijab while on the job. She subsequently quit the party. In her letter, Mourani accused the PQ of wanting to conduct an election on the "backs of believers." The federal politician says everyone is a Quebecer, without exception. “I have come to the conclusion that my belonging to Canada, including its Canadian Charter of Rights of Freedoms, better protects the Quebec identity of all citizens of Quebec," she wrote in the letter released Wednesday. The criminologist was first elected in the Montreal-area riding of Ahuntsic in 2006 and was one of only four Bloc MPs to be elected in 2011. The leader who cut her loose from the Bloc, Daniel Paille, announced this week he was stepping down from the political party for health reasons. A statement issued in the name of the Bloc caucus in Ottawa said the Charter of Rights and Freedoms was imposed against Quebec's will and has been an obstacle to the protection of Quebec's identity. As for Mourani, the statement said, "For us, it was clear that she was no longer a sovereigntist."